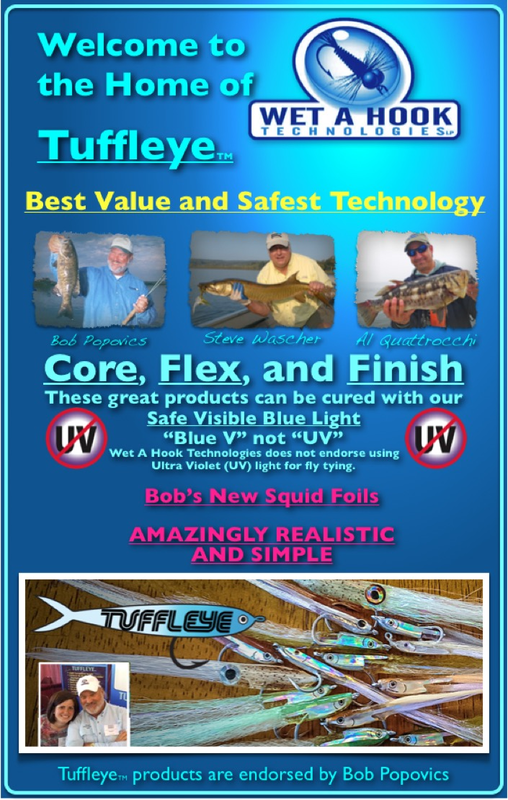 HOME "TUFFLEYE" | WELCOME TO - WET A HOOK TECHNOLOGIES "TUFFLEYE"
WELCOME TO - WET A HOOK TECHNOLOGIES "TUFFLEYE"
IF YOU CAN IMAGINE IT YOU CAN MAKE IT WITH TUFFLEYE! Tuffleye has been developed by Medical professionals with you and the environment in mind. You have to see Tuffleye Acrylic cured in 5-10 seconds to believe it. "Wow, what I can do with this" is the common statement. This is the site that will lead you through a new world of fly tying. Just click on the menur bar in the top right hand corner of this page.